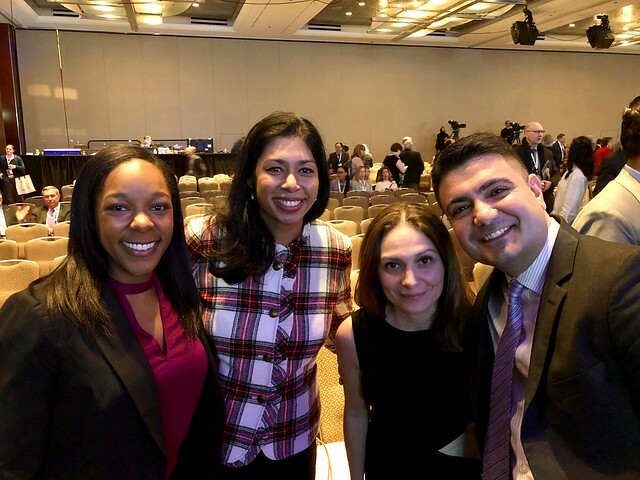 Faculty from UTHealth School of Dentistry at Houston attended the 2019 ADEA annual session in Chicago, including the Gies Awards presentation. With nearly 50 faculty, staff and students leading discussions, winning awards, or presenting seminars, workshops, and posters, UTHealth School of Dentistry at Houston had a big presence at the American Dental Education Association’s 2019 Annual Session and Exhibition in Chicago even before five faculty members and one student won some of ADEA’s most prestigious honors. Ryan Quock, DDS, distinguished teaching professor and vice chair of the Department of Restorative Dentistry and Prosthodontics, became the new chair-elect of the American Dental Education Association Board of Directors for 2019-20. He will serve a one-year term as chair-elect, one year as chair, and one year as immediate past chair. A 2005 alumnus of the School of Dentistry, Quock is the first faculty member from UTSD to hold the office since former Dean John Victor Olson was elected in 1969. Shalizeh “Shelly” Patel, DDS, director of clinical simulation and an associate professor in the Department of Restorative Dentistry and Prosthodontics, won the ADEA Colgate-Palmolive Co. Excellence in Teaching Award. Winners are chosen on the basis of demonstrated creativity and innovation in curriculum design and delivery, performance evaluations by peers and students, exemplary mentoring skills, an identifiable impact on student learning, and many other criteria. The award provides support to educators to enhance teaching efforts. Elizabeth Hamilton, DDS, and Dharini van der Hoeven, PhD, were awarded ADEA Faculty of Color Tuition Scholarships for Professional Development. The scholarships will enable them to attend the three-and-a-half day ADEA Summer Program for Emerging Academic Leadership, which covers topics essential to planning and implementing a successful academic career. Hamilton is an assistant professor in the Department of General Practice and Dental Public Health, while van der Hoeven is an associate professor of the Department of Diagnostic and Biomedical Sciences. Amber Lovatos, RDH, BSDH, assistant professor in the Department of Periodontics and Dental Hygiene, won the ADEA/Sigma Phi Alpha Linda DeVore Scholarship, which goes to an individual pursuing allied dental education at the baccalaureate, master’s or doctoral degree levels. Lovatos is enrolled in a master’s degree program at UT Health San Antonio School of Dentistry. Karen D’Mello, a senior dental hygiene student, won an ADEA/Crest Oral-B Scholarship for Dental Hygiene Students Pursuing Academic Careers. The scholarships support dental hygiene students who are pursuing education beyond an associate degree and who have an interest in academic careers. In addition to these award winners, several others from UTSD were elected to officer positions in ADEA’s various sections. On the final day of the conference, hundreds of people attended a plenary reception on “Achieving Excellence through Difference,” where they saw a video about the Summer Health Professions Education Program at UTHealth School of Dentistry, Cizik School of Nursing, and McGovern Medical School.